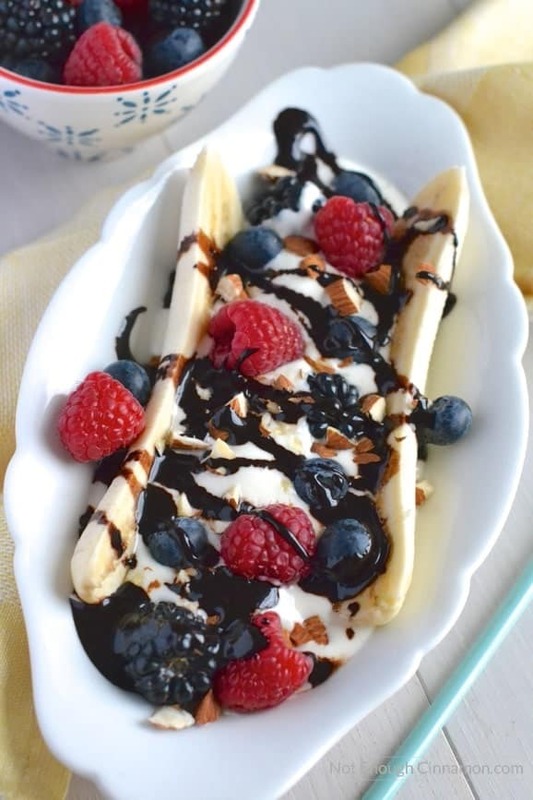 My healthy banana split comes with frozen Greek Yogurt, fresh summer berries and a generous drizzle of homemade clean eating chocolate sauce, that’s made without refined sugar! Girlfriends, in case you needed proof that eating healthy doesn’t have to be boring and sad… this healthy banana split is IT! YEs our pretty and clean eating approved banana split right here is the ultimate proof. See how gorgeous and mouth-watering it looks? It just makes me wanna faceplant my computer’s screen. And it’s not just pretty looks, this healthy twist in the classic banana split dessert tastes great too! You really don’t have to give up on all the food you love to live a healthy lifestyle, you just need to adjust them a little bit to improve their nutritional profile. 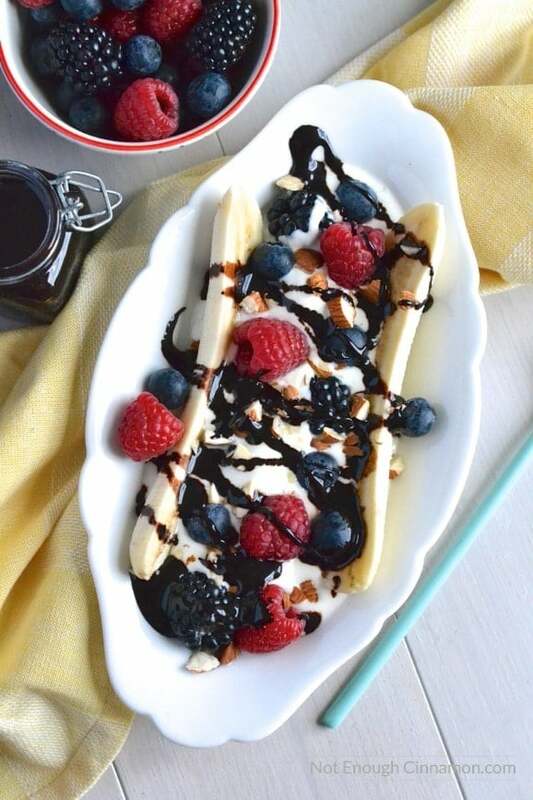 Save those calories by making my Healthy Banana Split this summer! See, a standard banana split can pack up to 1000 calories and 30 grams of fat. That’s basically eating half or more of your daily calorie allowance for dessert. Yikes! Not to mention that besides the banana, it’s not really nutritious. Does it mean you should banish it altogether if you want to stay on track? Definitely NOT! Just make your own healthy version! In this recipe, I’m using frozen Greek yogurt instead of ice cream to lower the fat and sugar content of out healthy banana split. You can also use frozen yogurt if you have access to a good brand without too much sugar where you live. That would be even closer to the real deal! The homemade clean eating chocolate sauce I found here is just the BOMB. Make a big batch, store it in the fridge and use it as a guilt-free topping over fruits, yogurt, ice cream, desserts…you name it! 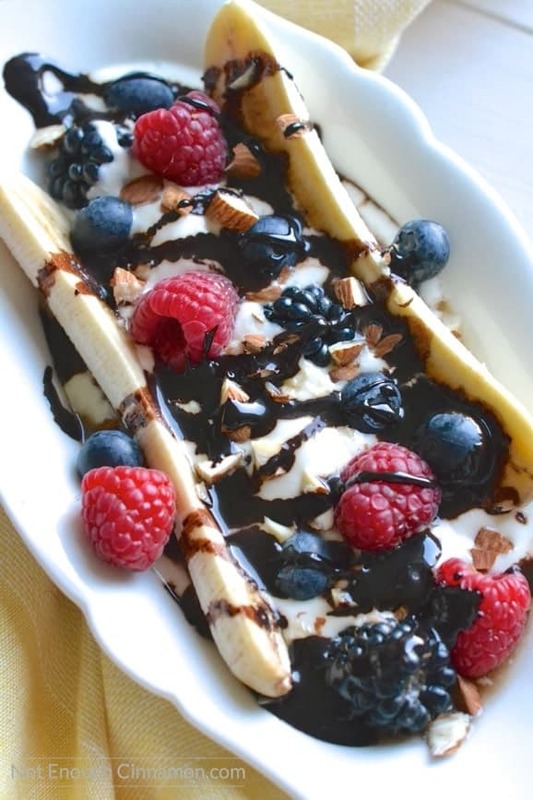 If you tried this Healthy Banana Split with Frozen Greek Yogurt & Clean Eating Chocolate Sauce, don’t forget to rate the recipe below and let me know how it went in the comments – I love hearing from you! You can also follow me on Instagram, Pinterest, and Facebook for more deliciousness and behind-the-scenes! My healthy banana split comes with frozen Greek Yogurt, fresh summer berries and a generous drizzle of homemade clean eating chocolate sauce, that's made without refined sugar! This is the healthy summer treat you've been waiting for! If using Greek yogurt instead of frozen Greek yogurt, combine yogurt, honey and vanilla. Slice the bananas in half and place a slice on each side of two boat-shaped bowls. Add a few berries in the area between the slices then add yogurt, spreading it out evenly. Top with remaining berries. Sprinkle with roasted almond. Drizzle with chocolate sauce (recipe below) and serve immediately. Remove from the heat and cool at room temperature. Pour into a glass jar with lid and refrigerate. It will keep a couple of months in the fridge. You can use frozen yogurt if you have access to a good brand without too much sugar where you live. Otherwise, use regular Greek yogurt. You can also top the bananas with granola and other chopped nuts. You had me and healthy and banana spilt! This is fabulous, beautiful presentation as well! This is mouthwatering. Thanks for sharing this recipe! I will try this for sure.